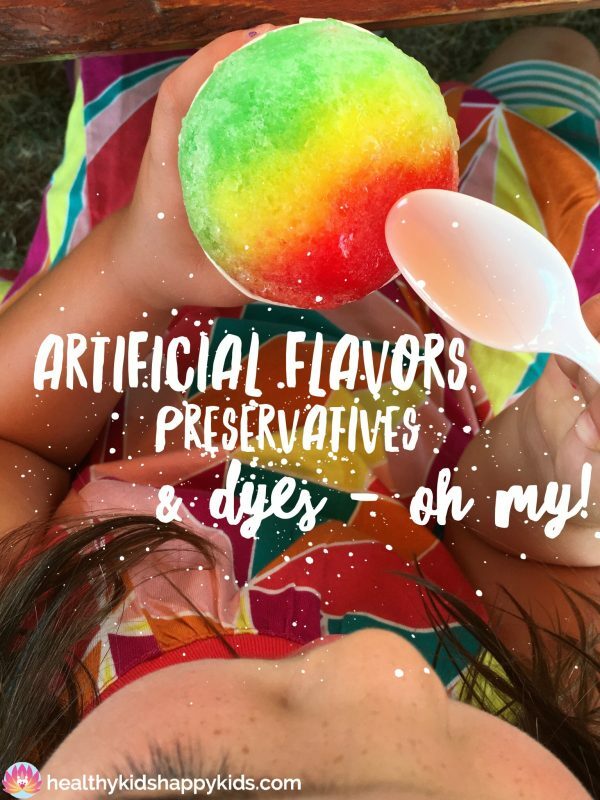 Artificial Flavors, Preservatives & Dyes – OH MY! The summer is heating up, and your kid is begging for that neon-colored snow cone. Do you do it? You’ve all heard the advice to take out the artificial junk in your kids’ diet and eat whole, organic, unprocessed foods. We’ve all embraced it – sort of. I mean, how bad can the occasional red Gatorade or bomb pop really be? Uh – really bad. And if your kid has ADHD/ADD, focus and attention problems, sensory issues, behavioral challenges, mood swings, anxiety and depression, seizures, headaches, sleep problems, ANY neurologic issue – then Really REALLY BAD! 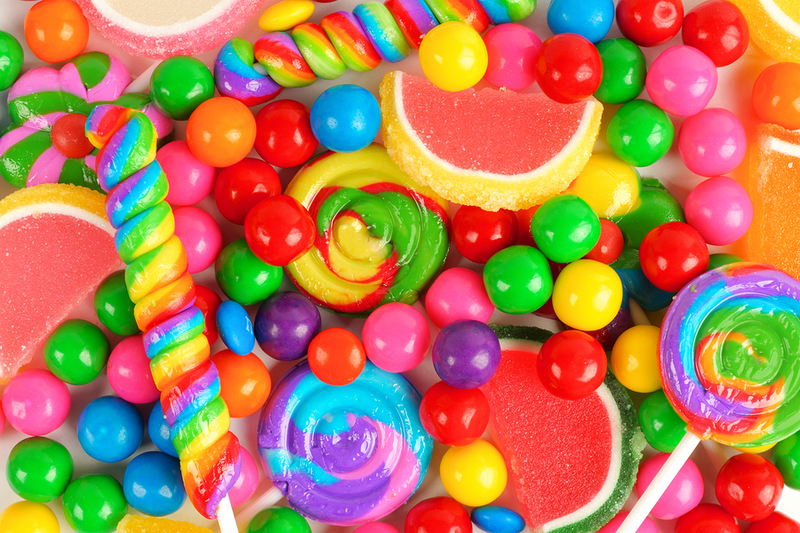 Way back in the 1970s, San Francisco allergist, Dr. Ben Feingold, found that food dyes and certain other natural and artificial components of foods caused hyperactivity and behavioral problems in children and adults1. For some kids, the “Feingold diet” – which eliminates all artificial flavors, dyes, and preservatives, and restricts foods high in naturally occurring compounds called salicylates and phenols – can be life-changing. Kids with ADHD tell me that they feel in control of their bodies now. I’ve been able to help kids get off or stay off ADHD meds by changing their diet. When your usually sweet, calm child has total out-of-the-blue-throwing-kicking-screaming-hitting-who-is-this-child all out meltdowns that you can’t do anything about – that can be a thing of the past! All of a sudden, kids can stand and want hugs and kisses from their parents. All of a sudden, they can walk by their sister without body slamming her, or sit calmly in class without constantly tapping their pencil or poking at the kid next door. 1 in 3 kids with ADHD might be helped simply by removing artificial food dyes in their diet!!! OMG! If your kid with ADHD symptoms, behavioral problems, sensory issues – you name it – could get better by removing all artificial food dyes, wouldn’t you try it? Amyl acetate: In addition to its use as a flavoring agent, amyl acetate is used as a paint and lacquer solvent. Benzyl isobutyrate: This is a common ingredient in fragrances. It is used in detergents, soaps and household products. Butyric acid: Again, a flavoring. A fatty acid; foul-smelling, with the odor of rancid butter. The smell may cause nausea. Used in making plastics and disinfectants. Harmful if inhaled. Corrosive. Dipropyl ketone: A flavoring. May cause coughing, sore throat, headaches, dizziness, vomiting. Used as a solvent for many resins. If you see anything that says “Artificial Flavors”, you may already be running away. But what if it says “Natural flavors”? Sounds great, right? It’s NATURAL! How the heck could it be bad for you? Unfortunately, “Natural flavors” is often code word for MSG or other “natural” chemicals that can harm neurologic health. And “flavor” can mean just about anything. Not only that, the FDA doesn’t require manufacturers to list “incidental additives” on their food labels. So that means even “natural flavors” can include 100s of small amounts of distinct substances, including natural or artificial emulsifiers, solvents, and preservatives. Whoa! “Artificial” and “natural” flavors really aren’t that different. Foods that are labeled “organic” and have natural flavors are probably better. For “organic foods,” the natural flavor must have been produced without synthetic solvents, carriers and artificial preservatives. But if a food was just “made with organic ingredients,” manufacturers have more leeway to use artificial ingredients and solvents. Has the FDA really done anything to regulate artificial additives in our food and protect our kids health? NO! Since 2010, the European Union has required manufacturers to put a warning label on foods containing artificial food dyes that they “may have an adverse effect on activity and attention in children.”9 It’s time for the FDA to step up and do the same! Did you know that several multi-national food corporations (McDonald’s, Kraft, PepsiCo, Kellogg’s, Betty Crocker, Mars) have 2 SEPARATE food lines? One for the US that uses artificial food additives like artificial food flavors, colors, and preservatives, and one for European markets that only uses real fruit and natural colors? The reason – because supposedly Americans have different taste and appearance standards. In February 2015, Nestle announced that it was going to remove artificial flavors and colors in candy, NOT due to concern for health risks, but due to consumer demand, and that they will not compromise on taste and appearance. Can I do a virtual eye roll now, please?!?! 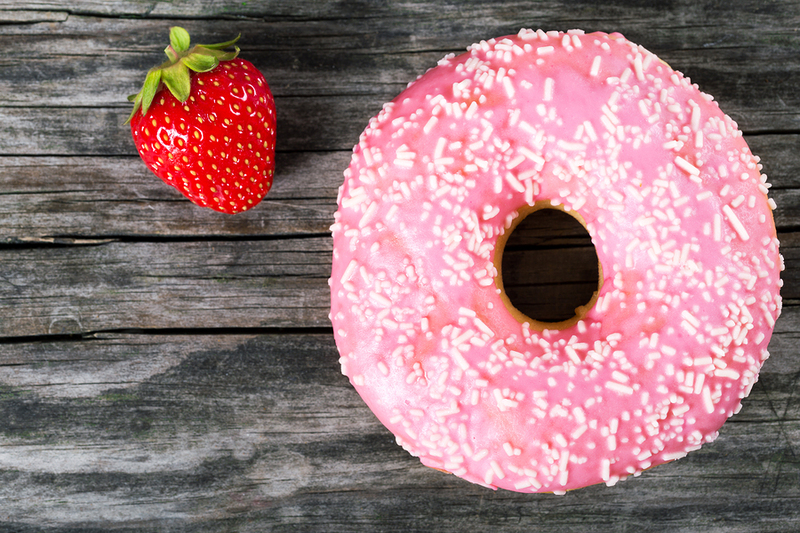 SO, WHAT FOOD ADDITIVES SHOULD YOU AVOID? Basic rule – READ LABELS. If you can’t pronounce it, DON’T give it to your kids! Of course, as soon as you see anything that says “artificial” – RUN! If it says “natural”, then take pause. And if it says “organic,” it’s possibly something to consider giving your kid. Stick to whole, organic, unprocessed foods as much as possible. Avoid artificial flavors, colors and preservatives – pretty much anything you can’t pronounce. If your child has attention, focus, sensory, behavioral issues of any sort – stay tuned for more tips on how to help! If you found this information useful, or know another parent or educator who would, then please do pass it on. It’s so important to get this information out there! And be sure to follow me on Facebook (www.facebook.com/DrElisaSongMD) and on Instagram (@healthykids_happykids) for more daily advice and adventures! Schab DW, Trinh N-H T. “Do Artificial Food Colorings Promote Hyperactivity in Children with Hyperactive Syndromes? A Meta-Analysis of Double-Blind Placebo-Controlled Trials.” J Dev Behav Pediatr. 2004; 25:423-34. Stevenson J, Buitelaar J, Cortese S, Ferrin M, Konofal E, et al. “Research Review: The Role of Diet in the Treatment of Attention-Deficit/Hyperactivity Disorder – An Appraisal of the Evidence on Efficacy and Recommendations on the Design of Future Studies.” Journal of Child Psychology and Psychiatry. First published online, February 19, 2014. Editor’s note. “ADHD and Food Additives Revisited.” AAP Grand Rounds. 2008;19;17 DOI: 10.1542/gr.19-2-17. Arnold LE, Lofthouse N, Hurt E. “Artificial Food Colors and Attention-Deficit/Hyperactivity Symptoms: Conclusions to Dye for.” Neurotherapeutics, 2012; 9: 599-609.